Rosa canina (commonly known as the wild dog rose) is a variable climbing wild rose species native to Europe, northwest Africa and western Asia. High in Vitamin C, rose hips are useful in preventing a variety of ailments - scurvy and the common cold in particular. Infusion of 2-3 teaspoons of dried, crushed, hips per cup of water. 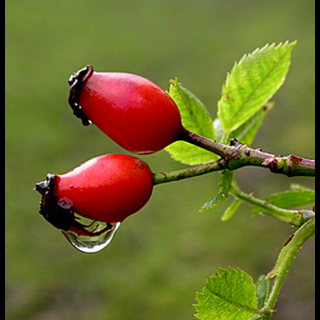 Dog rose flowers are followed by the production of rose hips, which turn orange or bright red when mature. The hips contain seeds that need scarifying before planting by hand. Once the hips are cleaned and the seeds are removed, store the seed in damp peat moss for two to three weeks in the refrigerator. After sowing the seeds in the spring, it can take them up to two years to germinate. Rose hips are best when harvested one week or so after the first frost, or in late fall if your area doesn't have frost. That harvest time allows a rose plant to produce as much sugar as possible; rose hips harvested earlier taste quite tart. If you don't have a forecast of frost to guide you, look for deep-red rose hips that are slightly soft when you squeeze them.